Yumonomics | Making Economics Yummy to the Common Core! Making Economics Yummy to the Common Core! Check out the Good Egg Project at Discovery Education. They have some excellent resources to consider our new the Farm-to-Table theme. Sign up at the Good Egg Project for their virtual field tour on March 23rd, so your students can travel through the supply chain, beginning at the Creighton Family Farm. How cool is that? There are some excellent interactive lessons for K-5 and Middle School that can be used for Language Arts, Mathematics, and Science. The lessons use multiple diverse texts: videos, virtual trips, charts, data, etc. Standard SS.K.E.1.1 Describe different kinds of jobs that people do and the tools or equipment used. Activity: As we watch/read/view, look for the different jobs people need to do and the tools they need to use to get the eggs from the farm to the table. Record these (draw/write) and then make a timeline. Standard SS.1.E.1.4 Distinguish people as buyers, sellers, and producers of goods and services. Activity: As we read/view through the material, consider who are the buyers, sellers, and producers of the goods and services necessary as eggs go from farm to table. Take notes at each phase. How do the buyers and sellers change? What goods and services were necessary? Standard SS.2.E.1.2 Recognize that people supply goods and services based on consumer demands. Activity: As we travel from farm to table, consider the consumer demands at each stage. Who supplies goods? What services are provided? How do these all connect? If I want to buy an egg, what were all of the goods and services that needed to be provided along the way? Sequence the process. First the farmer . . .
Standard SS.3.E.1.3 Recognize that buyers and sellers interact to exchange goods and services through the use of trade or money. Activity: What are the goods? What services are provided? How are things exchanged? How do you think the people are paid for their goods and services? Draw a picture that shows the interactions and explain how different buyers and sellers interact throughout the processes from farm to table. Standard SS.4.E.1.1: Entrepreneurship. Activity: Consider some of the entrepreneurs throughout the farm to table process. Conduct some research to find some Florida entrepreneurs who are involved in agriculture. Are there any eggs-tea special farmers in Florida? STANDARD SS.5.E.1.3 Trace the development of technology and the impact of major inventions on business productivity during the early development of the United States. Activity: As you view/read, take note of inventions that did not exist during the early development of the United States. How do you think these inventions impacted farming from farm to table? For example, consider transportation — how were eggs transported before gasoline-powered transportation, like trucks? How about the farmers? What equipment do they use now and how do you think it has changed the ways in which eggs are produced? Planning a pizza party takes skills of mathematics and economics! How many people will be at your party? How many pieces do you estimate each person will eat? How many pizzas should be veggie? The questions are endless! And they all require modeling with math and economic decision-making! For example, I love these MEA lessons from CPalms that help students model real world problems. Read the book Curious George and the Pizza Party and/or view Curious George Makes a Pizza. After you are familiar with the story, try the K-2 MEA Pizza Party with Curious George . In this lesson, your students read letters and data sets and try to make decisions about satisfying needs for a pizza party. If you love that lesson, here are more Pizza MEA lessons to try! MEA Elementary: Which pizza place should cater a birthday party? This year, we have decided to combine Economics with STEM and Literacy. We will be using real world activities to try to take the Eek out of Economics, the Scary out of Science, the Terror out of Technology, the Eerie out of Engineering, and the Monster out of Mathematics! Each lesson will start with a hook activity that requires using Economic concepts and Decision-Making. These hooks (movie clips, images, books, maps, artifacts, etc.) will then lead into a real-world STEM question. Each lesson will show how students need to understand Economic Decision Making as part of a real world STEM problem. For the STEM lessons, we will begin with some great examples from CPalms. Please feel free to send us your ideas so we can build this site! The first lesson is Eek-onomics & Scary Science. Using the trailer from the movie Monsters Inc., students identify a scarcity problem that the monsters have and use scientific inquiry to solve the problem and make a decision. Eek-onomics and Scary Science: Solve the Monsters’ Energy Crisis! 1) Discuss the movie with the students using some of the following questions: The monsters have a problem. It is harder to scare children; therefore, they are not able to produce enough energy to run their power company. What other sources of energy could they use to run their power plant? What are the costs/benefits of the different sources of energy? For example, compare and contrast renewable energy to other forms of non-renewable (fossil fuels). 2) Then conduct some research on renewable energy. What type of renewable energy would you recommend? Why? 3) After working out the monster’s problem, consider the real world. In this MEA (Model Eliciting Activity) lesson on CPalms, students are faced with a challenge: “Sunny Land Developing is about to develop a new community in Florida. Students are needed to make suggestions for the company’s choice of energy to integrate into the new homes. In this activity, students will review how people use electricity in their daily lives and learn about the differences between renewable and nonrenewable energy resources. Students will also be introduced to sound energy and how it is measured.” Although this is a third grade lesson, it could easily be adapted to any other grade level. This MEA has an excellent formative and summative evaluation and could be adapted to other grade levels! Since Common Core State Standards emerged, informational texts have become very important in the classroom. Opposite to fiction, informational texts are classified under “non-fiction” texts. However, in elementary content areas, a hybrid form of text, a fact-packed book that uses fictional characters to provide information, is gaining popularity. In Economics, these texts can be particularly useful. Take for example One Cent, Two Cents, Old Cent, New Cent. 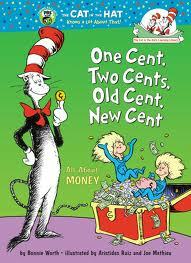 In this book, children learn about the history of money and the different attributes of currency. This is an excellent text to use with third grade Florida Social Studies standards about the characteristics of money: Standard SS.3.E.1.2 Standard 1: Beginning Economics List the characteristics of money. While sharing this book in an interactive read-aloud, have your students take notes about the characteristics of money they find in the story. Conduct a shared reading of selections from pages 1-5 of the Federal Reserve Money text as a resource to help organize student information. For example, students can categorize their information under: 1) what is money? ; 2) uses of money (medium of exchange, unit of account, and store of value); and/or 3) the six characteristics of money (durable, portable, divisible, scarce, uniform and acceptable). Performance Task: Students can collect their evidence and choose some images from the websites to create their own digital stories to show their knowledge. The easiest way to create digital books is to have students use PowerPoint (especially if they already know how to create slide shows). They can transfer their skills to use PowerPoint to make books that show digitally and can also print out. Are you looking for a great text to use in your classroom to expand economics concepts? Then you have come to the right place. On this post, I provide Economic-Based Questions (EBQ’s) for How to Make an Apple Pie and See the World and then follow the questions with CCSS tasks for K-3 educators to use with Florida NGSSS for Economics. Page 1: What ingredients or productive resources does the little baker need to bake her pie? Pages 2-3: Oh no! The store is closed, so she has scarce resources. What choices do you think she has to solve her problem of scarce resources? (You can stop and record their ideas). Page 4: What does she decide to do? Page 6: Watch for the goods she gets and services she uses on her trip. For example, on page 5, what transportation service is she using? On page 6, what good is she gathering? Page 11:The little baker’s incentive was that she wanted to find the best ingredients in the world. What might be the consequences? Page 12: What are the productive resources? Let’s watch for/label some natural, human, and/or capital resources with sticky notes (you may want to go back and label these together). Pages 24-25: What are the tools or capital resources the little baker uses to make the pie? Pages 26-27: Remember on pages 2-3 when the store was closed for ingredients. Let’s review our choices. Now, what alternatives does she have if the store is closed and she wants ice cream? (Possible choices: buy at another store, make it, travel around the world to get the best ingredients to make it, or don’t buy it). Last Page: What were the possible consequences of the little baker’s decision to travel the world to make her pie? Did she use money or other currency? What would her adventure cost? Think about the decisions you would make if you were the baker. What would you do? After Reading: Use “Focus Econ-cepts for Grades” to reinforce specific standard concepts. K: K:SS.K.E.1.1 Describe different of jobs that people do and the tools and equipment used. Before Reading: What are the tools and equipment needed to make an apple pie? What jobs do people do to make pie (ingredients)? During Reading: Thumbs up for tools or jobs. After Reading: Let’s review the tools and jobs. 1st Grade: 1 SS.1.E.1.6. Distinguish people as buyers, sellers, and producers of goods and services. Before Reading: Pretend you want to make an apple pie. What goods/services would you use? Who would be the buyers, sellers, producers? During Reading: Thumbs up for econ-cepts. After Reading: Let’s review the goods and services. Who were the buyers, sellers, and producers of these goods and services? 2nd Grade: SS.2.E.1.1 Recognize that people make choices because of limited (scarce) resources. Before Reading: In this story, the little baker wants to make an apple pie but has scarce ingredients. Let’s see what choices she makes. During Reading: Thumbs up for scarcity/choices. 3rd Grade: SSS: Recognize that buyers and sellers exchange goods and services through trade or money. Before Reading: What goods/services would you want to make a pie? How could you use money or trade? Who would be the buyers and sellers? During Reading: Focus on the problem of scarce resources. Then thumbs-up for other econ-cepts. After Reading: How did buyers and sellers interact to exchange goods and services? What was missing? (money discussion—find prices or trade for goods). During Reading: During reading, there are perfect opportunities for discussing these econ-cepts. Cover: Fancy Nancy is making cupcakes. What goods do you need to buy at the supermarket to make cupcakes? Look at the picture. What are some of the resources she is using? P. 13-15: Capital resources are the tools used to make the cupcakes. What tools are used? Human resources are the people who help make the cupcakes. Who are the human resources and what jobs are they doing? P. 19: Nancy is making a deal with a friend to exchange 2 brownies for 2 cupcakes. Does that make money for the school library? How does that exchange benefit Nancy and her friend? Nancy will exchange some cupcakes for other goods. She will also sell cupcakes in exchange for currency-money. P. 25: After Nancy’s disaster where the dog eats the cupcakes, her father also brought home resources to make cupcakes. What goods did he have in his bag? Were these the same goods mom bought? Anything different? Do you remember what you call goods that are used to make another product? That’s right! Intermediate goods. They are in the middle of being goods themselves (flour, sugar, etc.) and being made into another product (a cupcake). P. 27: What jobs were people doing on pages 25-27 in order to make cupcakes? What equipment (capital resources) or tools did they use? Was there anything different from the tools on pages 13-15? P. 29-30: The bake-sale! Who are the buyers? Who are the sellers? What are all of the goods for sale? How do you think people paid for the baked goods? Where do you think they stored the money? Before Reading: What are the tools and equipment needed to make cupcakes? What jobs do people do to make cupcakes? After Reading: Let’s review the tools and jobs. Now let’s make our own cupcakes or watch a video and find out what other tools and equipment are needed. Students can draw a picture or make a comic about how cupcakes are made. Before Reading: Pretend you want to make cupcakes. What goods/services would you use? After Reading: Let’s review the goods and services. Who were the buyers, sellers, and producers of these goods and services? Now put in your own ideas. If you were going to have a cupcake stand, where would you get your goods? Who would be the seller? How would you get buyers/customers? Would you advertise? Make your poster/advertisement. Before Reading: Fancy Nancy wants to help the library bakesale. When the dog eats her cupcakes she has scarce resources. What choices does she have? After Reading: What if Nancy’s dad didn’t bring home ingredients? What could they have done? What choices would they have? What decision would you make? Alexander Used to Be Rich . . .
One of my favorite books for integrating real-world mathematics and economic/financial literacy is Alexander Who Used to Be Rich Last Sunday. KidsEconPosters has some great EBQ’s (Economic Based Questions) to use while reading the story. Problem Solving Inside the Text:Follow the trail of money through the story. Create money pictures and/or equations to represent Alexanders exchanges. What was Alexander’s money problem at the end of the story? Let’s start at the beginning of the text again. What happens if we change some of Alexander’s money decisions? Create your own money problem. Imagine you received twenty dollars from your favorite aunt. Would you spend it all? What would you buy? Would you save some or all of it? Draw a picture to explain your financial activities and illustrate your mathematical problem solving decisions. Videotape your discussion to show what you know or use a whiteboard app on a mobile device-like ShowMe to demonstrate how you figured out the answer. Explore More for Econ: Explore the new $100.00 note with the U.S. Bureau of Engraving and Printing NewMoney.gov. Check out the New Security Features tab and click on the Explore Interactive Note button for a very cool virtual tour of the $100 dollar bill, as well as the $5, $10, $20, & $5!